Jenn started skydiving in 2002 and had made about 1000 jumps when TWA began. She taught herself to fly wingsuits at jump 316 and now has hundreds of flights behind her. In 2005 she became the 21st instructor for Phoenix-Fly and has trained over 100 new wingsuiters since then. She is also a Texas women's RW record holder, participated in the Texas Wingsuit Formation record at Skyfest in 2007, and holds VSCR #97. 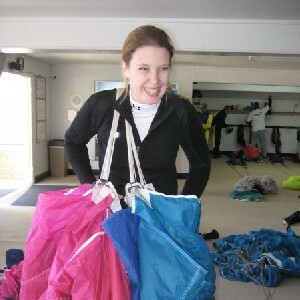 In March 2007 she married fellow jumper and Larry Hinson, and they both are regulars at Skydive Houston in Waller, TX.